Most of my meals are eaten at my desk, straight from the Tupperware, its cover gently dipping in the middle, battered by too many runs in the microwave. Others are eaten cold from the fridge, the TV on, a book with yellowed pages in the other hand; many are gobbled down as quickly as possible, like my morning porridge, perched on a chair, staring at the clock with the same intensity of a film hero about to detonate a time bomb. So the thought of making an occasion of food, of dedicating an hour or maybe two of my life to food, only food, is always appealing. And the thought of eating with my hands is even more thrilling. Now, my previous experiences with Ethiopian food: not many. A stall at the Festa dell’Unità in Rome, where my friend Luca worked one summer. Bare legs, the smell of late summer, warmth and grass, sitting on a wooden bench. We flinched at some items on the menu – raw meat? Raw meat? This was before an endless stream of tartares impossibly dressed in all shades of mustards and salts and quickly mixed with sticky egg yolks, of course. A hearty beef stew eaten in a Styrofoam container, with a spoon. Then, a small restaurant in Rome, a friendly, if a little invasive owner, plastic chairs and tables, plump lemons on the bizarre wax tablecloth. Sticky floor. The food brownish, creamy, served on a sort of sour pancake. The view on the main road, rubbish collecting at every corner, tired trams, worn down people, scrawny cats, layers upon layers of posters falling to pieces (because the Rome of my adolescence looks nothing like the warm-toned fantasy of ancient facades and cobble streets). But there was something about that memory, even though a bittersweet one for some reason I can’t quite remember, that always left me wanting to go again. To eat stew with my hands (because yes, cutlery is banished in Ethiopian restaurants). There is something especially fine about stews when it’s cold outside, thick socks and gloves on, the wind biting, your breath forming a curious cloud whenever you speak. Stews are wholesome, good-natured, a blanket of meat and vegetables to warm you up to your core. So on an impossibly beautiful late autumn day (London only gets so many beautiful autumn days…) we went to The Queen of Sheba to see how much of my memory was actually true. We were greeted by soft lighting, soft music, friendly owners, couples and friends nursing pots of tea, colourful portraits of the Queen of Sheba herself, a nutty, sweet scent in the air that I could not quite make out (we’ll get to that later). We choose three dishes: diced chicken, sautéed with onion and spinach; mince beef with Ethiopian butter and spices; a chickpea stew. They are delicately spooned over a huge, sponge-like, pillowy disk of injera, its slightly sour bite a blessing to cut through the butteriness of the dishes. 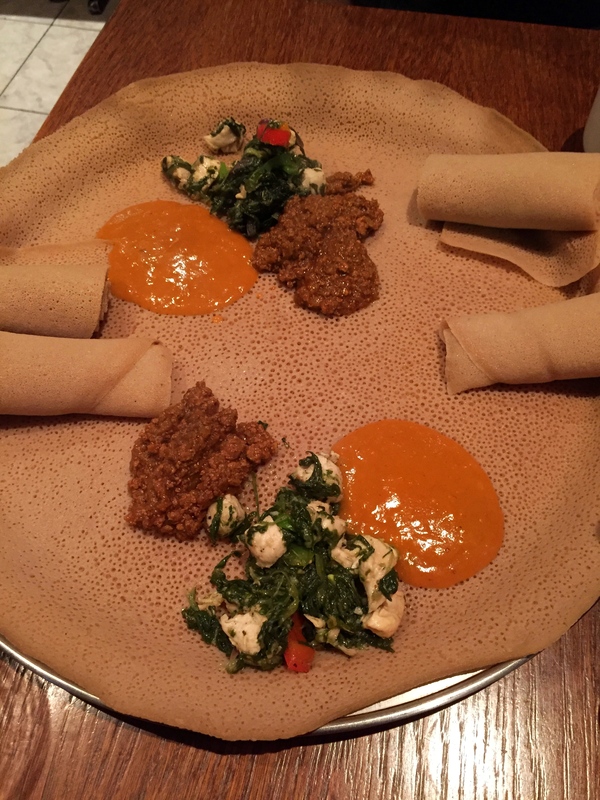 We are also give some extra injera, rolled in a way that makes it look a lot like hot towels you get on an airplane – only delicious. There is something about tearing a piece of this flatbread and mopping up the sauces that feels convivial, and intimate, and simple. The silky chickpea stew, the quiet spice of vibrant chicken, and the louder, buttery spicy mince (my favourite) are slowly picked up from the disk of injure among laughter, conversation, smiles. You will end up brushing against the people you’re dining with, and you won’t look especially dignified, but it all makes it even more fun. Ordering a pot of coffee is an experience in itself. They roast the beans in front of you, in a small pan, blackened by time, and give you a whiff of the enticing smell which is not dissimilar from roasted chestnuts; they then bring a pot to the table with small cups and cubes of brown sugar. The coffee is strong, silky, strangely calming, and will give you just enough energy to muster the courage to leave this oasis of spices and roasting coffee and go back into the cold. As the soft lighting did not prove ideal to take pictures, I am leaving you with a couple of snapchat videos.